The Federal Court building in Melbourne houses three Courts each of which is independent and unrelated to each other. The Federal Government wished to implement a network of Digital Signage displays throughout the building to show listing details for all Courts. The requirement was to install this without imposing any additional workload on the Court staff. 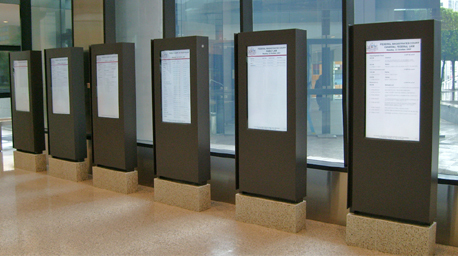 The installation was handled by Corporate Initiatives of Melbourne utilizing Wallflower Dynamic Digital Signage Software. In conjunction with Wallflower staff a technique was developed to utilise the existing email listing details sent out daily to newspapers. Wallflower Dynamic Digital Signage Software was enhanced to allow the Scheduler to receive the daily emails and then to dissect them and format the relevant listing details using a set of business rules. The ground floor series of 6 displays shows details of all Courts in the building and displays positioned outside each Court show details for that Court. All Digital Signage Displays get updated using email. The implementation ensures staff have no additional tasks to undertake. If any changes are required during the day staff simply re-send an amended version of the daily email and the displays are updated immediately. For more details about Corporate Initiatives visit www.ciasia.com.au.